Okay, folks, this is the mani that was supposed to be posted yesterday. Unfortunately, I had to address some criticism from some rather judgmental women on Pinterest. 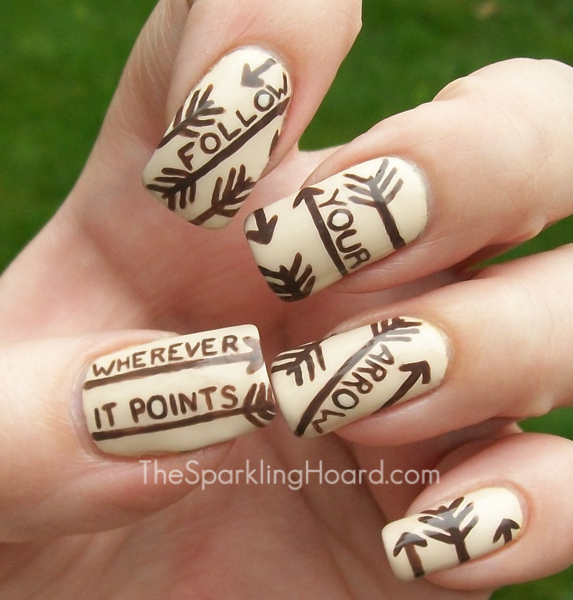 It's kind of funny, really...my post on a mani inspired by a song which preaches the importance of ignoring judgmental people was delayed by me having to deal with judgmental people! I really cannot thank all of you enough for supporting me and reaching out to me during that mess, by the way. It meant the world to me <3 . Practice! These letters came out much better than the first letters I ever did! Your letters will likely end up bigger than you imagined, so give yourself extra space. Capital letters are easier than lowercase letters. Use a brush with a very fine point. If you have one of those cheap sets of nail art brushes, I really like the brush with the bent ferrule (metal part) and the short brush with the fat handle. Break your letters into portions. For example, the letter R requires 3 separate strokes (the main line, the curved part, and the little "leg"). Your O's will likely always be wonky. Paint a good shape and then dot your base color in the center. This will even out the empty space in the center of the O. If a letter has a curved portion (D, R, S, etc), I find it's easier to do the curved areas from bottom to top rather than from top to bottom. If you don't like the long stripers or you need a finer line, choose a short striper or a detail brush. Put the tip down at one end and move/rock the nail being painted without really moving your brush. Moving the nail across a stationary brush is often easier than moving your tiny brush in a straight line along a stationary nail. If your line is wobbly, go over it again with polish and then touch things up by drawing a line alongside it in acetone (this should erase any polish that got too far out of line). Do a rough draft of your design on a nail wheel, especially if you're trying a new technique. Always use a slightly thicker top coat (think Seche Vite, Butter London Hardwear, Poshe, etc.) on top of your base. This will allow you to erase some mistakes with clean acetone without damaging your base color. Put a few drops of the polish you are using onto a palette and periodically add nail polish thinner to it. It's much easier to paint with polish that is of a slightly thinner consistency (just don't thin it too much or else it will be runny and dissolve your base color). Frequently remove built-up polish from your brush by swishing it in acetone. This keeps your brush from being all fat and blobby, allowing you to make precise strokes. All products purchased by me. I am not associated with Kacey Musgraves. The song "Follow Your Arrow" does not belong to me. Still love this. I will never be able to paint letter this perfectly. Thanks! You never know, get some nail wheels and practice! Amazing! I have to laugh when I think of how my lettering would turn out... You have some steady hands, girlie! Thank you! And aww, you should give it a try anyway, you never know! As far as having steady hands...only on good days, unfortunately :-( . On bad days, I can't hold the brushes properly/can't do smooth strokes/etc. I try to take advantage of the good days and get any nail art done then lol. Thanks! Yay! And yeah, I've never gotten a nice, even O by just drawing it, the dotting makes such a huge difference! I will warn you, though, lettering is one of the most frustrating and time-consuming things you can do to a nail lol.